Pell stays in the race. 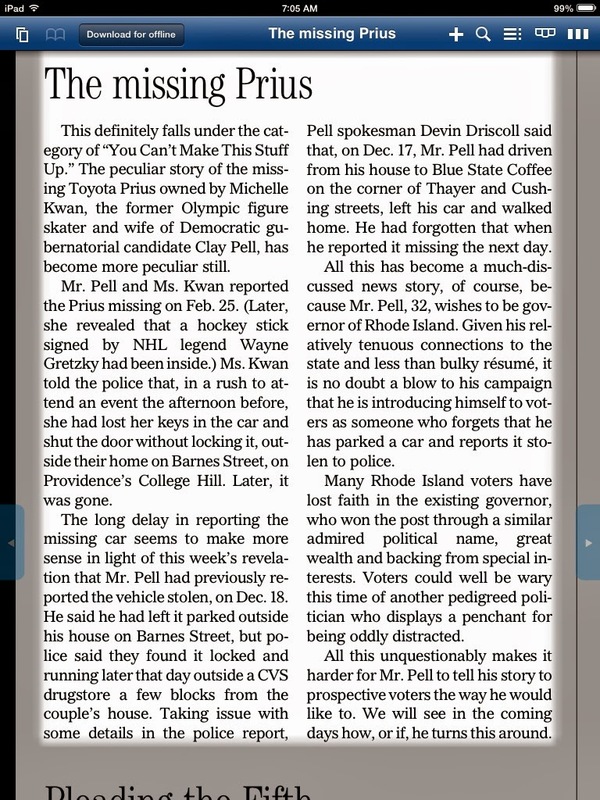 Scathing Projo editorial on missing Prius. Despite public ridicule of epic proportions, Clay Pell seems intent on staying in the race( pride?) for Governor of a Rhode Island. Pell has been in hiding since a series of embarrassing stories started to emerge regarding his missing Prius. The Pell campaign did receive some good news today with the first of several union endorsements (On board with Clay.) The fact anyone would endorse " Clay-boy" is a real sign of how much the unions hate Raimondo. Instead of cutting a deal with Angel, they seem intent on propping up their " puppet" candidate. The unions better hope Clay can find his Prius on debate night or it will be a long campaign. Pell has been good news for a Governor Chafee who now seems like George Washington compared to Pell. Follow all the hi jinks and fun of the campaign by listening to John DePetro on WPRO.